This walk: 2014-4-16. Venford Reservoir, Holne Town Gutter, bull's eye plates, Holne Moor Leat, Mine track, dry Wheal Emma Leat, RDH stones, cairns, mine workings, Ringleshutes Mine. View from Venford car park that on the eastern edge of the reservoir. Holne Town Gutter running to West Stoke, at SX 69018 70777. "V" marks the tree in the previous photograph, looking over Venford Reservoir. Looking east to Yar Tor (centre), Corndon Tor (behind) and Sharp Tor (right). The dry Wheal Emma Leat going under the bridge: the mine track is seen in the background. Looking over the modern cairn to the next cairn on the hilltop ahead. The next cairn, at SX 68493 69810. Boundary stone at SX 68443 69782: RDH signifies Richard Dawson, Lord of the Manor of Holne, who sold 700 acres of catchment area for Venford Reservoir (itself, 33 acres), to Paignton Urban District Council (PUDC) in 1907. There are 49 of these stones. The next cairn, SX 68095 69676: there are 8 Holne Lee cairns, arranged as alternating large and small cairns. Closer view of the cairn. Two RDH stones quite close together, just after the cairn above. Zoomed view showing the dam at the reservoir. "PUDC" on the reverse side. Looking down on the water that is running from left to right. Last view of the reservoir. 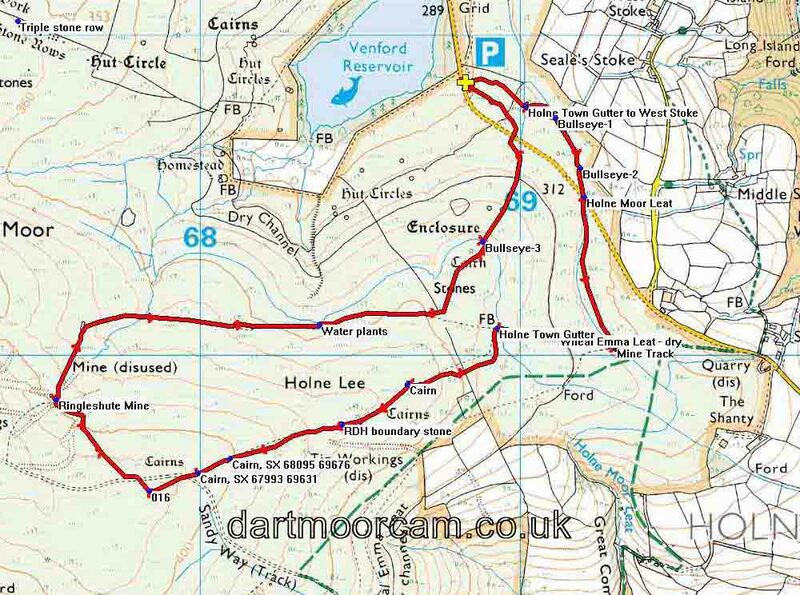 This walk was approached from the Plymouth direction by the A38 exit at Ashburton, following the road to Holne and parking at the P symbol on the map with the yellow cross. Distance - 5.97 km / 3.71 miles.